As a SELECT Part Store user, you’ll have access to promotions available ONLY through SELECT Part Store – at just the click of a button. No coupons to download, no paper to process. Your savings are recognized immediately at the time of your purchase. SELECT Part Store is a real-time, online program that gives your fleet’s service department a direct link to your local dealer’s parts department. 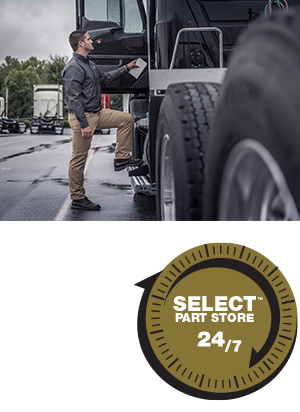 With SELECT you have 24 / 7 access to all-makes parts, all the time – regardless of truck make or model. That means you’ll be able to look up parts, check dealer inventories, verify your pricing and place orders at any time of the day or night. With SELECT, you can purchase the parts you need through your LOCAL dealership. Think of it as the 24 / 7 link to your local dealership’s virtual parts counter! Plus, your customer-specific pricing is loaded into SELECT, so you’ll see the same price on the SELECT screen as you would receive by calling the dealership counter. Complex pricing – such as seasonal, quantity breaks, ﬂeet, OEM programs and kits – are also accommodated. With SELECT Part Store, you have round-the-clock access to your dealer’s current inventory, so you’ll know the exact availability and price of the parts you need. Save time and effort by quickly accessing orders and invoices online. Each invoice history includes orders placed to your Volvo dealer through SELECT Part Store. 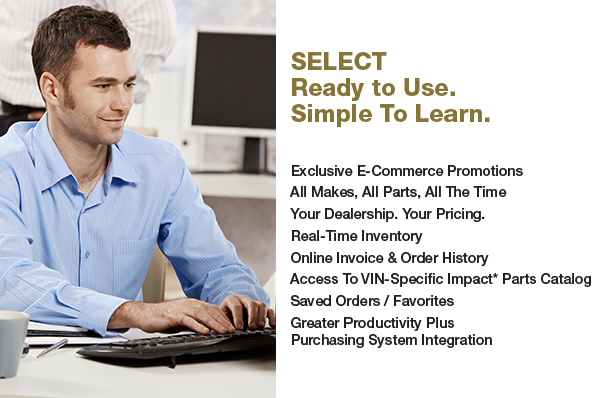 With SELECT Part Store, you’ll have access to IMPACT, our VIN-specific parts catalog. Impact provides all the model-specific information you need to service and maintain your fleet, including component breakdown and identification, major unit serial numbers, system schematics, service bulletins and manuals, and tool inventory tracking. New vehicles are easily added as your fleet grows. SELECT Part Store simplifies ordering by creating – and saving – lists of frequently ordered parts. Simply SELECT Part Store your list, verify quantities and submit your order. The program easily manages saved orders for different product types. To reorder, simply SELECT Part Store the saved order, move to a shopping cart and submit. Dealer inventory will be verified to give you the most current availability. SELECT Part Store gives fleets more control, ease and speed when it comes to ordering parts and expediting truck repairs. Check parts availability, research part numbers, review invoice and transaction histories and more. Plus, SELECT can integrate with Fleet purchasing systems, such as Ariba. It’s one more way Volvo is working to support the efficiency and profitability of your business.